Alison Krauss is an American bluegrass-country singer, songwriter and fiddler. She has become the most recognized face in contemporary bluegrass, a critically acclaimed artist who has brought modern sophistication to the genre while respecting its traditions. Jamie Dailey and Darrin Vincent are veterans of Bluegrass music having some twenty years experience between the two of them from long tenures with Bluegrass and Country legends Doyle Lawson and Ricky Skaggs. In 2003, long time friends and colleagues, Jamie Dailey and Darrin Vincent, were asked to perform on a Koch Records recording titled "Christmas Grass Vol.2 2004. Jamie and Darrin recorded a well known Christmas song, "Beautiful Star of Bethlehem", with just a guitar and mandolin and their two voices. The David Grisman Quartet is the primary musical vehicle for mandolinist David Grisman. Founded in 1975, the band has featured the talents of well over a dozen musicians in the decades since, including such seminal newgrass/new acoustic artists as Tony Rice, Mark O'Connor, Darol Anger, Mike Marshall and Rob Wasserman.The band's music has been characterized as a mixture of bluegrass, jazz (particularly gypsy jazz and jazz fusion), while also including other elements of traditional folk musics and some of the spirit of late '60's/early '70's Bay Area rock. If you're familiar with bluegrass music, then you're tuned in to some of what Greensky Bluegrass does. They're also known to throw a great party, rock n roll, and (if the critics are to be believed) they have great songs. They are unquestionably a team of friends that traverse the country making music they enjoy. What makes Greensky different than Bluegrass? "Head for the Hills has created a sound that is all at once organic, precise, timeless, and brand-new,” as reported by the Missoula Independent. The acclaimed Colorado quartet has been receiving nation-wide recognition in response to their refreshing take on acoustic music. Described as “modern acoustic” music, H4TH produces an endearing mixture of homegrown compositions, traditional harmonies, and improvisation. In the live setting, H4TH ventures into a myriad of musical styles and sonic landscapes that appeal to a boundless array of listeners. Hot Rize is approaching its 30th year in the bluegrass history book. After not performing for three years following the death of original member, flat-picking extraordinaire Charles Sawtelle, the band regrouped in 2002 with Bryan Sutton added on guitar. Hot Rize has done five years of shows with its current lineup and has been delivering its high-energy, soulful, and unique sound to fans old and new. Though many years from its full-time touring period of 1978-1990, Hot Rize has kept its legend growing by delivering first-class music and entertainment as only it can. John Jorgenson (born 6 July 1956, in Madison, Wisconsin) is an American musician. 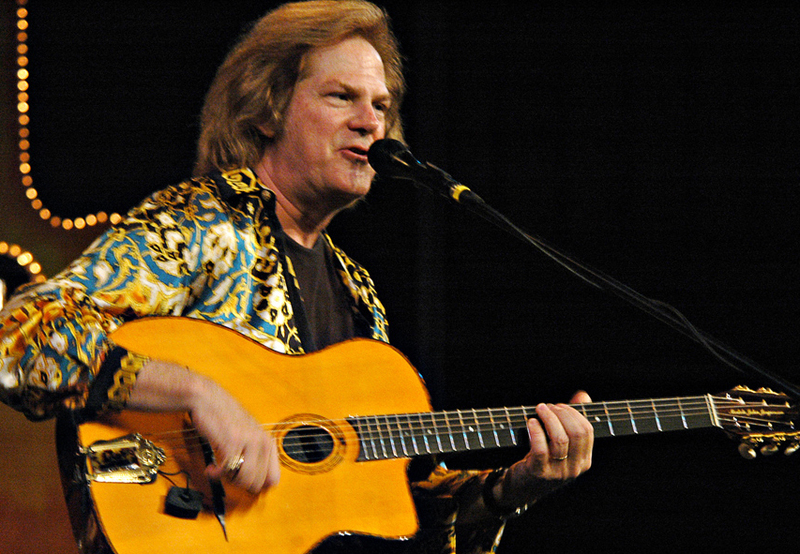 Although best known for his guitar work with bands such as the Desert Rose Band and The Hellecasters, Jorgenson is also proficient in the mandolin, mandocello, Dobro, pedal steel, piano, upright bass, clarinet, bassoon and saxophone. Kentucky Thunder, or Ricky Skaggs and Kentucky Thunder, is the band that plays with Ricky Skaggs. Many members of the band have won numerous awards. Bandleader Ricky Skaggs plays mandolin and is the lead vocalist. The group has won the Instrumental Group of the Year award from the International Bluegrass Music Association multiple times, as well as seven Grammy Awards. Peter Rowan (b. July 4, 1942 in Boston, Massachusetts) is an American bluegrass musician and composer. Rowan plays guitar and mandolin, yodels and sings. While in high school in 1956, Peter formed the Tex-Mex group The Cupids which became locally famous and self-released a single. The Steep Canyon Rangers are an American bluegrass band from Brevard, North Carolina, USA. Formed in 2001, they have built a reputation as an engaging acoustic quintet seasoned by constant touring. Members are Woody Platt (Guitar/Lead Vocals), Mike Guggino (Mandolin/Vocals), Graham Sharp (Banjo/Vocals), Charles R. Humphrey III (Bass/Vocals) and Nicky Sanders (Fiddle/Vocals). The Del McCoury Band is a Grammy Award-winning bluegrass band. Originally Del McCoury and the Dixie Pals with Del on guitar and his brother Jerry on bass, the band went through a number of changes until the 1980s when the band solidified its line-up, adding McCoury's sons, Ronnie and Robbie on mandolin and banjo, respectively. In 1988, the "Dixie Pals" name was dropped in favor of the current name. Tim O'Brien (b. March 16, 1954 in Wheeling, West Virginia) is an American bluegrass, old time and celtic musician. O'Brien plays guitar, fiddle, mandolin, bouzouki and mandocello and is an accomplished vocalist. He moved to Boulder, Colorado in the 1970s and became part of the music scene there.